Trying to find the distance between two points on the coordinate plane? 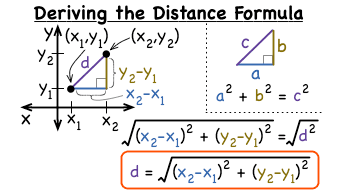 Use the distance formula! Can't remember it? Not a problem if you've watched this tutorial! This tutorial shows you how to derive the distance formula. You even use the Pythagorean theorem to find it! Take a look! Did you know that there are different kinds of triangles? Knowing how to identify these triangles is an important part of solving many problems involving these triangles. Check out this tutorial and learn about some of the different kinds of triangles! Looking for some terminology used with right triangles? Then this tutorial was made for you! In this tutorial, you'll be introduced to the names for the different parts of a right triangle. Check it out! The Pythagorean theorem is a very popular theorem that shows a special relationship between the sides of a right triangle. In this tutorial, you'll get introduced to the Pythagorean theorem and see how it's used to solve for a missing length on a right triangle! Trying to find the distance between two points? Use the distance formula! Want to see how it's done? Check out this tutorial!